Introduced in 2012 on the occasion Bovet’s 190th anniversary, the AMADEO® Fleurier Rising Star – Triple Time Zone Tourbillon Grand Complication proudly carries the FQF (Fleurier Quality Foundation) certification. This new jewel from Grand Complications” collection is entirely developed and manufactured in the workshops of DIMIER 1738, Manufacture de Haute Horlogerie Artisanale. This is the first ever timepiece to be certified by Fleurier Quality Foundation, an independent entity which delivers what is acknowledged to be the most stringent watch-making quality label in existence today. The tourbillon carriage has been extended to a diameter of 13.50mm. The carriage now appears to be suspended in mid-air, accentuating its aesthetic affinity with the historic design of timepieces dating from the 19thcentury. The rest of the movement makes use of the surface provided by two three-quarter plates, between which DIMIER 1738 watchmakers have succeeded in integrating a plethora of highly useful mechanisms and indications. In an additional tour de force, all indications are arranged in a consummate harmony of balance and symmetry. The horizontal axis of the main guilloche dial shows three time-zones. The two secondary time-zones are located at 9 o’clock and 3 o’clock and are supplemented respectively by the invaluable indication of one of twenty-four cities corresponding to the time-zone displayed, added to which are two day/night indicators. The vertical axis also shows the hours and minutes of the local time-zone (in the centre) a power reserve at 12 o’clock and the seconds-hand carried by the upper pivot of the tourbillon carriage at 6 o’clock. Pascal Raffy and his teams also added a reversed hand-fitting to the back of the timepiece, providing an indication of local time on a dial offset at 12 o’clock which carries the hands of this timepiece- numbering ten no less – without in any way compromising the legibility of the indications. The tourbillon carriage alone contains many examples of the meticulous care devoted to every detail, often inspired by timepieces found in the historic collections of the House of BOVET. Steel components adopt the emblematic form of period index assemblies. Bevellers have spared no effort in this succession of re-entering angles, rounded off to create a dazzling black polish with clean, bright edges. The rim of the balance also evokes its glorious ancestors. Its delicate profiles echo the shape of dynamic weights found in the balances of timepieces manufactured by Edouard Bovet in the 19thcentury. Since these weights are manufactured in blued steel, it is perfectly natural that the balance of this Rising Star should also be resplendent in royal blue. 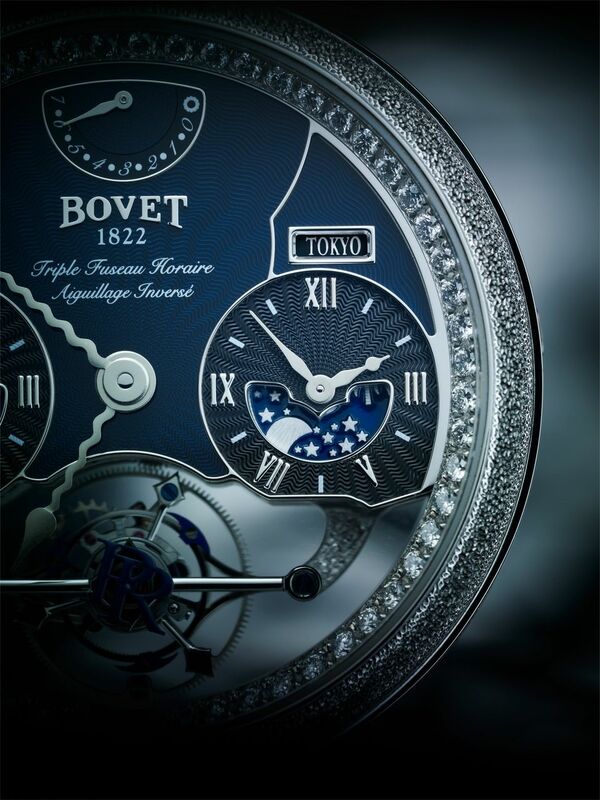 BOVET’s Rising Star is produced in a limited edition of produced in a limited edition of 190 pieces, completed by 9 pairs of unique pieces whose dials on the movement side are decorated with miniature paintings reprising the themes of enamels displayed on historic timepieces from the 19th century found in the private collections of the House of BOVET. And 9 pairs of unique pieces. 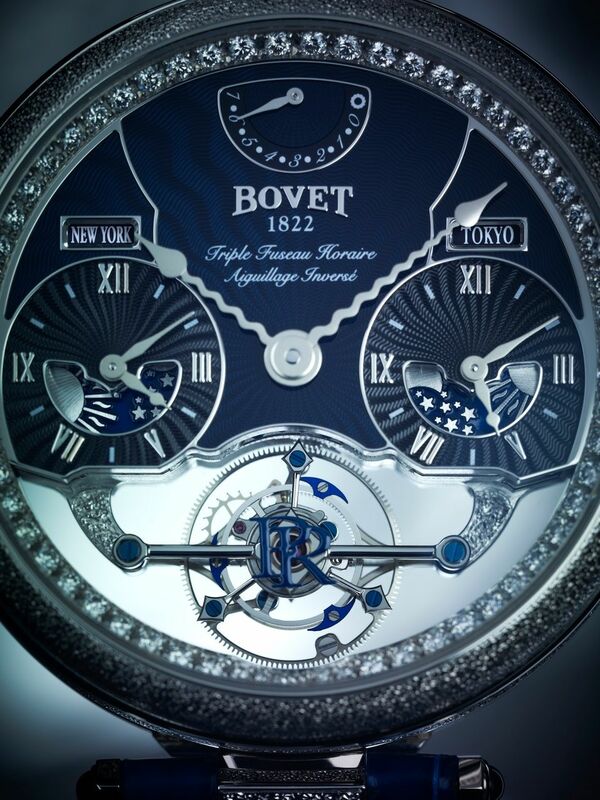 Pascal Raffy acquired the House of BOVET and became its sole proprietor in 2001. 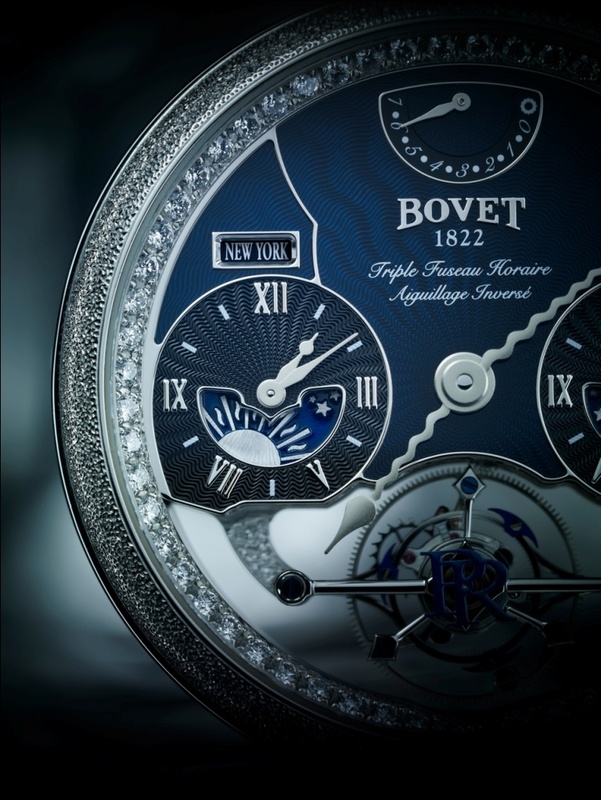 In that same year, BOVET co-founded the Fleurier Quality Foundation; an independent entity which delivers what is acknowledged to be the most stringent watchmaking quality label in existence today. On that occasion, Pascal Raffy promised that the first timepiece to be certified by the House of BOVET would be manufactured entirely in its own workshops. BOVET has just certified its Rising Star tourbillon timepiece manufactured entirely by DIMIER 1738 Manufacture de Haute Horlogerie Artisanale (Prestigious Craft Watchmaking Manufactory) which was acquired by Pascal Raffy in 2006. This is the most complicated timepiece to have been developed and manufactured by the House. With its 608 components, the Rising Star tourbillon is the emblematic model of the Grand Complications Collection. Its movement has a 7-day power reserve. In addition to showing the hours, minutes and seconds, the Rising Star tourbillon displays two further independent time zones. Each of the two has a precious day/night indicator and a disc listing twenty-four towns in the twenty-four different time zones. To qualify for the precious label, the timepieces must pass a wide range of exceptionally stringent tests. Each timepiece must satisfy both chronometric and aesthetic criteria, guarantee impeccable reliability, provide evidence of high quality manufacturing processes and be decorated according to the most stringent norms of Prestige Watchmaking. Last but not least, all of the components must be manufactured and assembled in Switzerland (100% Swiss Made). To justify a chronometric standard worthy of the label, the movements must first obtain a certificate issued by COSC (Offcial Swiss Chronometer Testing Institute). Since this certification is delivered for the movement alone, it is a recognized fact that the performance measured in the test may no longer be the same once the movement has been cased-up. That is why a second chronometry test is performed by the Fleurier Quality Foundation, once the timepiece has been completed and cased-up. These measurements are taken on a machine which has been specially developed by and for the FQF: the Fleuritest. This is a computer-controlled robot. The movements and daily activity of a wearer’s wrist have been programmed according to various models. With these different models, he Fleuritest therefore simulates the natural movements of a day’s use, while at the same time easuring and analyzing the rate and accuracy of the timepiece. The FQF label also requires the timepiece to be Chronofiable validated. Chronofiable is an independent laboratory whose role is to test the dependability of the components and entire timepiece over the long term. Accelerated “ageing” of the timepiece is simulated. For instance, each corrector is actuated as often as it would be in normal use over the lifetime of the timepiece. 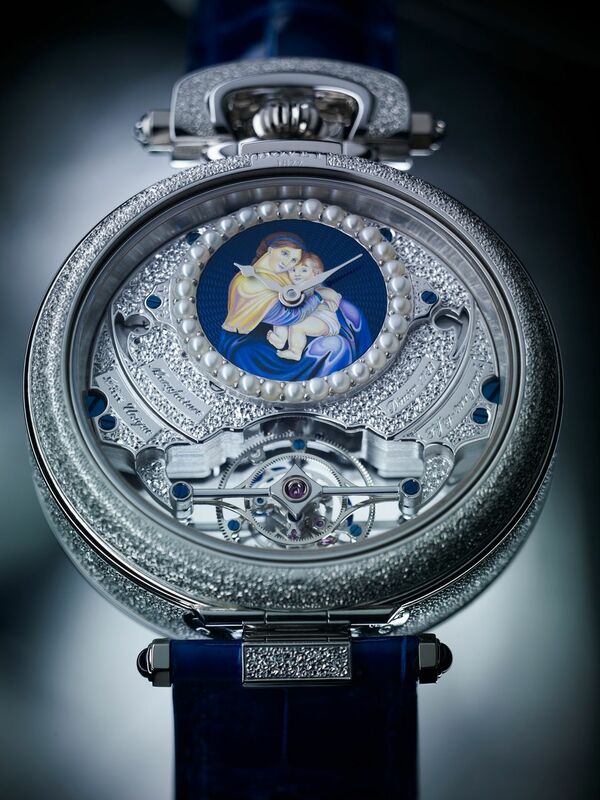 The prestige of the House of BOVET has been acquired over nearly two centuries through the combination of perfect chronometry and unrivalled use of the decorative arts applied to watchmaking. The Rising Star tourbillon therefore had nothing to fear from the uncompromising rigour of the experts at the Fleurier Quality Foundation. The movement was presented to them ¬ first in kit form so that each component could be examined individually in its entirety. The choice of materials, the resources deployed, the manufacturing techniques, selection of ¬ finishes and decoration have all been analysed at great length to determine compliance with the regulations adopted by the Foundation. A second expertise takes place once the movement has been ¬ finished and assembled in order to test the consistency between theory, aesthetics, functions, chronometry and durability of the movement. Because of the complexity of the Rising Star tourbillon movement, twelve months were needed to complete all of these tests.